A few days before our friend Karl arrived in Tortola, we settled ourselves in Trellis Bay, a comfortable anchorage near the airport. It is always a bit crowded there, but with our shallow draft we can get pretty close to shore and we don’t need as much chain out as others. The nicest thing about this bay is its long beach. Darwin loved it and we took him for many long walks. His highlights were the visits from three black labs every afternoon. These remarkable dogs swam from The Last Resort, a bar/restaurant on a little island in the middle of the bay (with great Happy Hours), to shore every day. When they were done playing, swimming and “fishing”, they would swim back home. 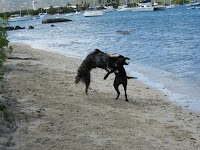 One of the dogs was an awesome playmate for Darwin. It had been a long time since he had so much fun. On February 6th, Karl joined us on Irie. Darwin was very happy to see him and immediately accepted him as part of the pack. A nasty north swell and heavy winds kept us a bit longer in Trellis Bay. During this time, Karl could get used to the Caribbean atmosphere, taste the boat life, enjoy some cocktails with Nini’s crew and explore the area. It was chillier than normally and the weather did not want to cooperate. When the swell went down, the wind was still blowing pretty hard and it rained every day. It was time to visit a few places, though. 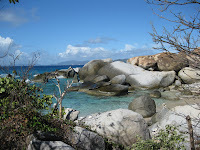 After filling our water tank at Marina Cay, we sailed Irie to Fallen Jerusalem, a rocky island south of Virgin Gorda. There, Karl swam to shore, chose a few big rocks and practised his bouldering techniques. The night was spent in Spanish Town. 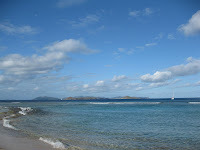 The next morning, we picked up Ed and Emily from Nini and motored to the Baths, the BVI’s number one attraction. By 8 am, we claimed our mooring ball. While eating a tasty breakfast of American pancakes, we watched the mad rush of arriving boats. The remaining mooring balls grew sparser every minute, so everybody wanted to pick one up as quickly as possible. More than once, we saw multiple sailboats race towards the same mooring ball. It was pretty funny. On shore our little group walked the gorgeous trail to Devil’s Bay. We meandered through walls of stone, under massive boulders, in clear water and along white sand beaches. It was the first time the sun was out in all its glory and we thoroughly enjoyed it. Once we made our way back, the whole area was flooded with tourists and boats were –illegally- anchored everywhere. Time to head back. But first, we snorkelled a bit in the aquamarine waters of the park, where colourful fish nibbled on the submerged boulders. As I wrote before, Gorda Sound is nothing special. It is a protected bay and the jump-off point for St. Maarten/St. Martin, the main reason we were there. One day Karl went to shore to do some hiking, while we stayed on the boat, slowly seeing our weather window for the crossing diminish. When, on Friday, it became clear that we couldn’t go to St. Martin the next day, we decided to pay a quick visit to Anegada. Something different to do. We had a perfect sail over there, and back the following day. The sun was finally shining again and the wind blew a nice 15 to 20 knots. We were flying and had a great time. Anegada reminded us of the Bahamas, a low lying island with white sand beaches and a very relaxed atmosphere.